We had an incredibly warm and beautiful day. The kids had been stuck in the house for a few days so we headed to a local park. It was a Monday holiday so the park was filled with families. One family had a baby about a year old or so. 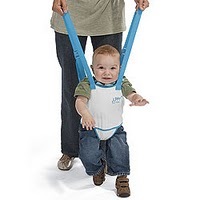 They had him in this contraption that looked like a bouncer with straps. I had never seen anything like it before, but I thought it was a great invention. As I sat on a bench there was a Mom and Dad at the table next to me. I overheard her tell him "Did you see that baby in the walking thing. Pathetic. 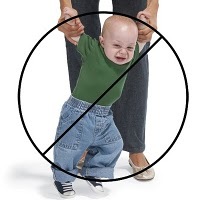 If your baby isn't ready to walk don't force them." Not ready to walk? The baby was at the stage where all he wants to do it try to walk. I remember months of my back hurting from holding The Phi's hands while she took little wobbly steps. Don't babies need to LEARN how to walk. This invention would have saved my back. I wondered what these parents did. Did they just let their kids sit there until the kid stood up and walked on their own? Then a few minutes later their son rode by on a bike with training wheels. He waved to his parent and they waved to him. Once he was gone the Mom says to the Dad "Finally it took that wimp forever to even get on a bike.". So maybe they didn't lovingly walk their baby around so I guess an invention like this would be pathetic to someone like that. I like the "new" contraption. Didn't you just want to slap those people, they're a fine example of who shouldn't breed. My suegra would use a towel under her kids arms- does the same thing. They have everything for babies!! It's nice when one actually works for your kid. They are all so different. And I agree with Jan... some people shouldn't breed!